Democratic presidential candidate Kamala Harris is becoming one of her party’s leading contenders for president. She is running second in the polls of announced Democratic candidates only after Bernie Sanders. Joe Biden leads both of them but he has not announced that he is running. Harris launched her campaign on January 27 and has soared ever since. But how far to the left is she? The entire Democratic field has lurched to the left, maybe in part due to the influence over the past couple of years by admitted socialist Sanders, who masquerades as a Democrat. Harris supports the socialist Medicare-for-all. She announced on August 30, 2017, at a town hall in Oakland that she would co-sponsor Bernie Sanders’ bill for single-payer healthcare. She wants to raise taxes on the top one percent of Americans and corporations. Harris opposes the death penalty — even for the worst killers. When San Francisco Police Officer Isaac Espinoza was brutally murdered in the Bayview district of San Francisco in 2004, Harris, as district attorney of the city, announced that she would not seek the death penalty for the perpetrator. Even left-wing California Senator Dianne Feinstein chided her for the decision, saying if she had known that, she might not have endorsed Harris for office. Similarly, in 2009, Harris sought only life in prison for Edwin Ramos, an illegal immigrant and MS-13 gang member who was accused of murdering Tony Bologna and his two sons. Harris claims that life without the possibility of parole is more cost effective than the death penalty. She apparently doesn’t consider the loss of life as part of the cost. She has a 100 percent rating from the Planned Parenthood Action Fund and a 0 percent rating by the National Right to Life Committee. The NRA has given her an F rating. While she was district attorney in San Francisco, she filed an amicus brief in District of Columbia v. Heller, arguing that Washington, D.C.’s extremely restrictive gun control law did not violate the Second Amendment. That landbreaking decision was the first Supreme Court case to decide that the Second Amendment protects an individual right to keep and bear arms for self-defense. She’s more moderate on Israel than many Democrats who hate Israel, but that may be because her husband is Jewish. She previously dated the notorious Willie Brown while he was speaker of the California Assembly. He was married at the time, but press reports referred to Harris as his girlfriend. In return, he appointed her to state jobs that paid $72,000 and $97,099 annually. After Brown was elected mayor of San Francisco, he dumped her, and and his wife appeared with him at his swearing-in. Harris’s own dad recently spoke out publicly against her. During a radio interview this month, she joked about whether she smoked pot as a teenager, “Half my family’s from Jamaica. Are you kidding me?” Her father, Donald Harris, an emeritus professor of economics at Stanford University, sent an unsolicited statement to Kingston-based Jamaica Global Online in response. “My dear departed grandmothers (whose extraordinary legacy I described in a recent essay on this website), as well as my deceased parents, must be turning in their grave right now to see their family’s name, reputation and proud Jamaican identity being connected, in any way, jokingly or not with the fraudulent stereotype of a pot-smoking joy seeker and in the pursuit of identity politics. Speaking for myself and my immediate Jamaican family, we wish to categorically dissociate ourselves from this travesty,” he wrote. 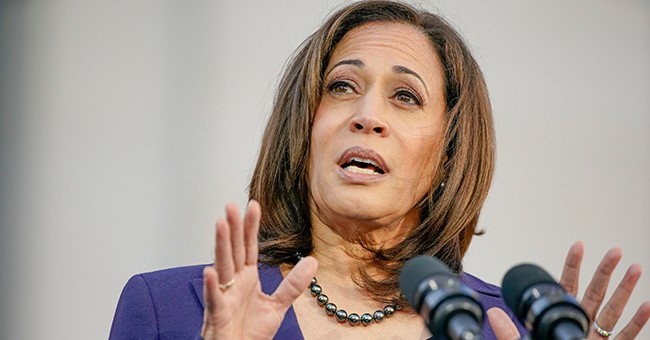 It speaks volumes that the elder Harris spoke out publicly criticizing his daughter, considering she is a powerful senator who may end up being president someday. During that same interview, Harris claimed she smoked pot while listening to rappers Tupac Shakur and Snoop Dogg. But this could not be true. Harris graduated from college in 1986, and those two artists didn’t make it onto the scene until the early ‘90s. Harris appears to have a need to pander to her black side, no matter how untrue or stereotypical her remarks are. We can only guess what she will say next in regards to her Indian side. Don’t believe the media spin that Kamala Harris is a moderate Democrat. Moderate Democrats don’t have zero ratings from the American Conservative Union. She isn’t much different than Bernie Sanders, endorsing his single-payer healthcare plan. But she has a lot of appeal, as potentially the first woman president and second black president. Don’t underestimate her — despite how far to the middle she will try to run as the election gets close.